There was a time when the cleaning and maintenance of public restrooms was not much of a topic for discussion. Today, however, heightened public awareness about the spread of germs and disease has increased the importance of maintaining sanitary restrooms. For operators of restaurants, healthcare facilities, schools, arenas and many other types of commercial and institutional facilities, the customer experience can be severely damaged from unsanitary, unsafe and uncomfortable conditions in restrooms. 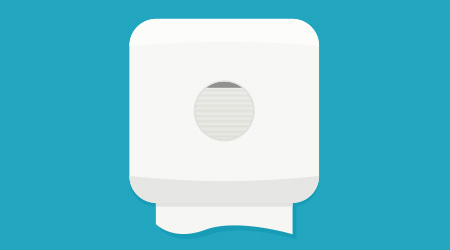 Hand dryers can dry hands fast (some in 10 to 15 seconds), eliminate paper waste and provide financial benefits, with industry consensus being a one-year return on investment. Additionally, facility managers are tapping into dryers for their green and sustainable capabilities, as well as improved hygiene. Despite all the pros from installing hand dryers in a restroom, one of the biggest challenges of their addition is the amount of water that drips down from patrons’ hands to the floor below. Another complaint includes the water that can be sprayed onto painted walls, which can leave unappealing watermarks and pool on the floor. This water poses a risk for slips and falls, attracts dirt and grime, can soil a restroom’s outward appearance or according to some, creates a home for harmful bacteria. It’s a complaint that manufacturers have heard for years, which is why many have bolstered their efforts to address the problem by including water-collection features such as drip trays, splashguards, ceramic plates that mount to the walls and wider-mouth dryers that direct water to a reservoir.